E and I live in a rather large detached house that was built in 1877. When people ask about our house I tell them that it isn’t that large but we’ve already lost three butlers and four maids who seemingly have gotten lost in the place. Joking apart though it is large for just two people but once, a few years ago there were seven living here. It is classed as a seven bedroom house, four bedrooms on the third level and three on the level above. There are three main lounges, a family room which serves as a dining room and a small kitchen. Other rooms include an en-suite bathroom, a family bathroom and a wet room. there are four main rooms in the cellar together with three small rooms/stores and a hallway. Three more hallways/landings are on the three other floors. Attached to either side of the house are two garages. Quite a lot of space to hide away in and quite a lot of space to fill too! On Friday E and I went out shopping for some LED light bulbs (or lamps). Both the newly built wet room and the main/family bathroom (undergoing refurbishment at the moment) have between them 16 LED down-lights (recessed into the ceiling) and we want as many of the other light fittings in the house to have LED lamps in them. Some of the rooms are fitted with fluorescent fittings as the main source of lighting, some in the cellar, some at the top of the house and of course the garages. Some rooms have large chandeliers which have six to 10 lamps in them others have less. Some of the rooms have wall lights too, each with two lamps in them. We purchased enough lamps for three chandeliers and six wall lights which amounted to 27 lamps of three different types and all of them LED’s. They cost us a little over £170. Ouch! As an exercise and to determine just how many light fittings there are in and about the house I counted them all both inside and out and discovered that there are 124 lamps of different types and sizes. Some are large fluorescent tubes, some are LED floodlights, some are chandeliers with many lamps in them and the total number of actual light fittings amounted to 84! Phew! We reckon we will need to spend quite a few hundred pounds more yet to replace all those that can be replaced with LED lamps. Even the fluorescent tubes can have LED tubes fitted. 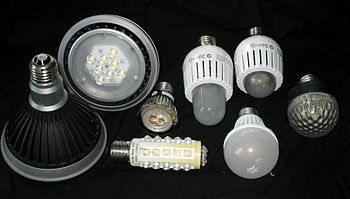 That is a lot of money to spend out in order to cut down on running costs and the payback period will be measured in years however, the LED lamps are supposed to have a 30,000 to 50,000 hour lifespan under normal usage which works out to be quite a few years too. There will be a saving on power usage of course which means less to fork out for electricity and less demand on the electricity supply system.